New rumours surrounding Sony say that any potential deal between them and Marvel for Spider-Man movies á la MCU would see the end of Andrew Garfield's time as Peter Parker. But why ditch one of the few great things to come from Sony's mishandling of the Spider-Man franchise? 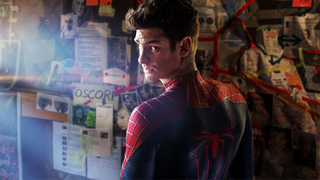 What Are Marvel&apos;s Secret Plans For Rebooting Spider-Man? Let's get this out of the way first - I don't hate them like many do, but I'm by no means the biggest fan of the Amazing Spider-Man movies so far. The first was an acceptable retelling of an origin story that didn't really need retelling, and the second... well, let's just say there were plenty of things wrong with it. But for me, the main pairing of Andrew Garfield as Peter Parker and Emma Stone as Gwen Stacy was one of the few things that Sony managed to actually get right with its reboot. That and the second movie's suit, but let's stick with that first bit for now. Andrew Garfield just nailed Spider-Man for me, for someone who's loved that character for years. Sure, he was a little too cool to be the nerdy Peter we're familiar with - the aspect of the character that Tobey Maguire's take in the Raimi movies excelled at - but as the slightly cocky, oddly charming and sarkily funny Spider-Man persona he shone. At least for me, it felt like we had a version of the character that echoed back to the quick witted and confident Spider-Man I remembered as a kid on screen at last (although Maguire's Spider-Man is still great, he was always a better Peter to me than Spidey). He wasn't perfect, and was hamstrung by some dodgy background stuff that I was decidedly not a fan of - but Garfield's Spider-Man was what I wanted for the character's movie-based escapades. That humour, the wittiness, was key, and it's something Garfield excelled at in the role. To lose out on that, so soon after he started, and just as he'd taken Spider-Man to an interesting place that could've been explored in a potential Amazing Spider-Man 3, feels like a waste of a great piece of casting. The other sad part of this is that what Marvel are purportedly looking for, according to Latino Review, sounds like the kind of situation Garfield's take on the character is in post TASM 2: An already established Spider-Man without a romantic situation being the biggest focus of his life (thanks to the other best part of the Amazing Reboot, Emma Stone's Gwen Stacy shuffling off the movie's mortal coil at the climax of of the film - at the cost of a more interesting film, to boot). Although there is a lot of mess around the character that I can see Marvel hesitant to draw on still, Garfield's Spidey is in the perfect place for him to be joined up into the ongoing Marvel Universe. Origin out of the way, at the end of a big romantic arc, already accepting of his role as Spider-Man - and even more importantly, in a place that you could ostensibly cut him solely out of Sony's bizarre plans to 'MCU-ify' that universe with their take on the Sinister Six and other spider-man projects and still keep the character largely intact. It seems like such a shame that in spite of the problems surrounding him, Garfield's Spider-Man is ideal for the MCU. If only he didn't have all that baggage. But at the same time, do we really need a third Spider-Man, so soon? There's already been the problem for DC of recreating characters for the big screen at the cost of another established version (looking at you, Flash). Spider-Man is popular enough of a character that I'm sure it would work, but it seems like the sort of thing that is made for confusing mainstream audiences. Who knows. If something does come out of these talks - and that's a big if, especially after the leaks - Marvel could do just right by one of their most popular heroes. They've rarely gone wrong before, and their track record for casting is consistently stellar (especially when you look at what might have been). There's plenty of great actors out there who could give us a great, MCU-approved Peter Parker. In the end though, whatever comes out of these potential movie deals it's sad to see that such a great take on Spider-Man will be lost to Sony's myriad misfires with its 'Amazing' reboot. When these rumours broke, the main reason why I didn't want an MCU Spider-Man just yet was to try and give Sony the chance to make a movie that did justice to their Spider-Man, and that looks like it's just not going to happen. To me, Garfield's Spider-Man will always be remembered as a Spidey too good for his own movies.